A native of Florence, Italy, Filippo Ciabatti is the music director of the Dartmouth Symphony Orchestra and the interim music director of the Dartmouth Glee Club. With director Peter Webster, Mr. Ciabatti created the Dartmouth Opera Lab, whose first production in October 2018 featured Grammy Award winning baritone Daniel Belcher and soprano Amy Owens. During the summer of 2018, he was invited to be a conducting Fellow at Stockholm’s Aurora Music Festival in Stockholm under the direction of Jukka-Pekka Saraste. During the festival, he conducted Hannah Kendall’s 2017 composition, “The Spark Catchers”, in a concert that also featured legendary cellist Mischa Maisky in the Konserthuset Stockholm. During the 2018-2019 academic year, Mr. Ciabatti is leading the Dartmouth Symphony Orchestra in an Italian tour in collaboration with the Orchestra Toscana dei Conservatori in prominent venues and festivals, including the Puccini Days in Lucca. He also makes his debut with the Vermont Symphony Orchestra. In 2017 – 2018, Mr. Ciabatti conducted Madama Butterfly at Opera North (NH), Hansel and Gretel and Don Giovanni (directed by Nathan Gunn) at the Lyric Theatre at Illinois. In 2016, Mr. Ciabatti conducted Tosca at Opera North (NH), directed by Russell Treyz, and Britten’s Midsummer Night’s Dream at the Lyric Theatre at Illinois, directed by Christopher Gillett. In 2015, he made his South American debut conducting the Universidad Central Symphony Orchestra in Bogota, Colombia, where he also taught masterclasses in orchestra and Italian opera. With La Nuova Aurora Opera, he conducted full productions of Handel’s Rodrigo (2015) and Purcell’s King Arthur (2016). 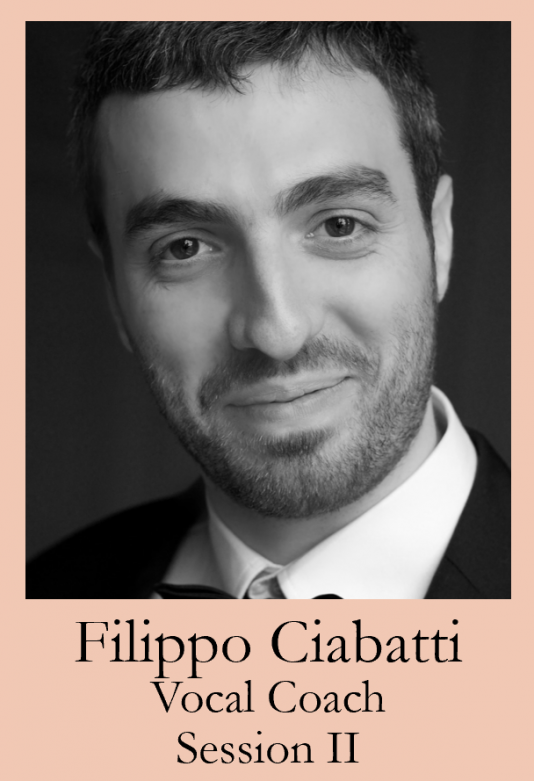 As a pianist and vocal coach in Italy, Mr. Ciabatti worked for the Cherubini Conservatory, Maggio Musicale Fiorentino and Florence Opera Academy. He has played for masterclasses of Renée Fleming, Nathan Gunn, William Matteuzzi, Donald George, and Isabel Leonard. He is currently music director and coach of Scuola Italia per Giovani Cantanti Lirici (Sant’Angelo in Vado, Italy), where he works with young singers and renowned coaches and directors.